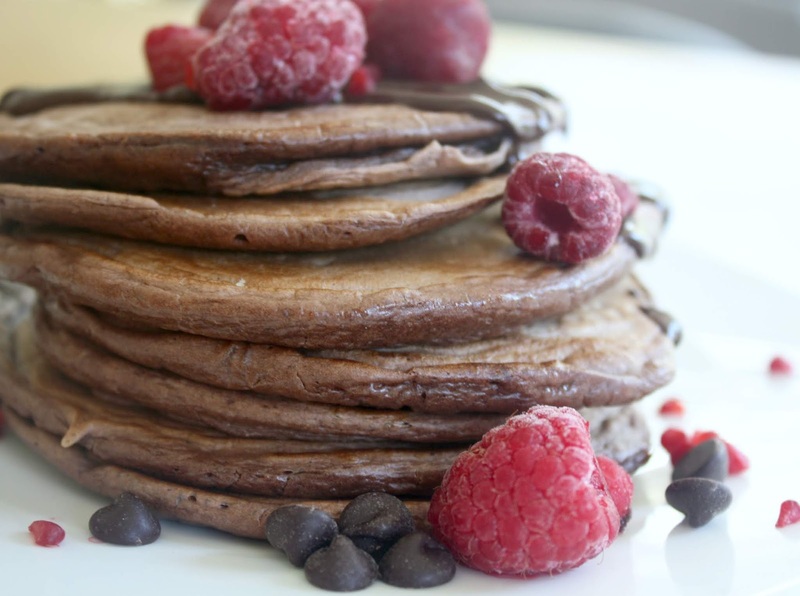 5-Min Fluffy Chocolate Pancakes // Vegan Recipe! Hey lovelies, back with another recipe and now onto one I've been meaning to do for ages: Pancakes! Pancakes had always been a Breakfast Treat for me, on those lazy weekends where I had more time to spare but now (after a bit of pancake-flipping practice) I can whip them up in 5mins. 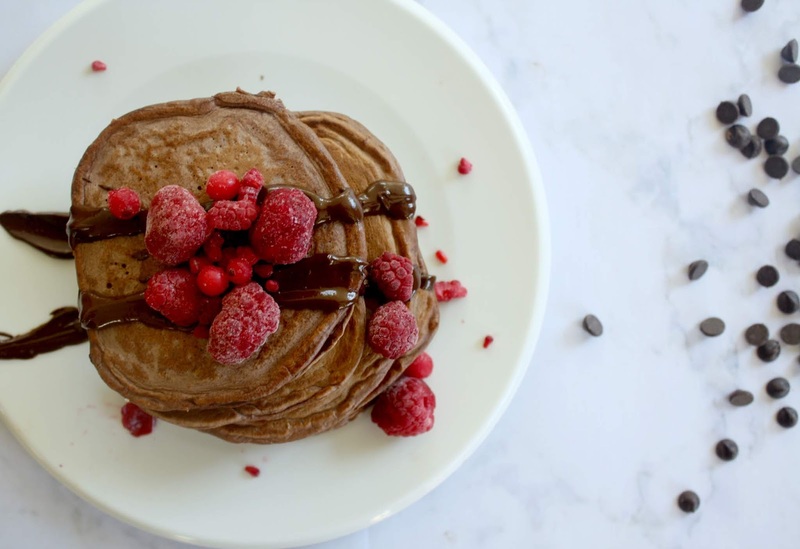 And that's where this recipe comes in: a stack of fluffy chocolate pancakes, Vegan, relatively healthy, and with only a handful of ingredients. So often I would look up Vegan recipes and they would contain a list of 15x different ingredients, including all different health foods I'm just too broke to have in my kitchen cupboard like 'Buckwheat Flour,' or 'Ground Flaxseed' so this recipe is perfect for the average person like me. All you'll need is that one over-ripe banana sitting in your fruit bowl and a handful of other ingredients you already have, and you're good to go. If you love American-Style fluffy pancakes, and all things sweet and chocolatey - you should definitely give this a go. Dark Chocolate Chips + Berries for the topping! 1.In a bowl mash the ripe banana until smooth, then combine with the wet ingredients. 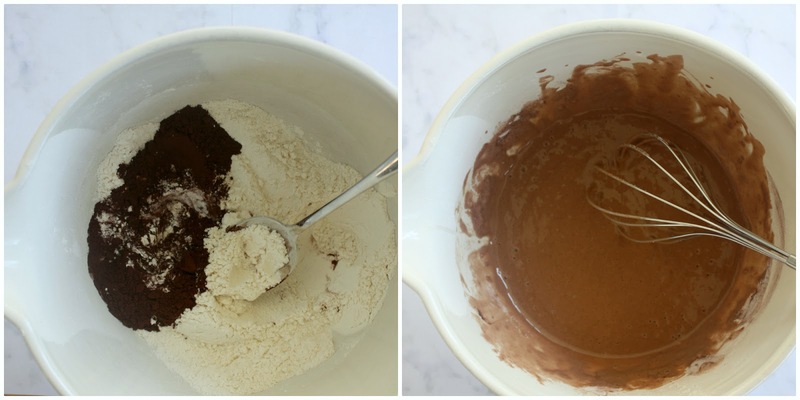 Then add in the flour, cocoa powder, and baking powder and whisk until the mixture forms a chocolatey pancake batter. 2. Lightly oil a pan and warm to a medium-low heat in prep for the pancakes. Pour even-sized scoops of the batter into the pan (my favourite way of doing this is using a soup ladle!) and cook for 2-3 minutes on each side or until you can see bubbles forming. 3. 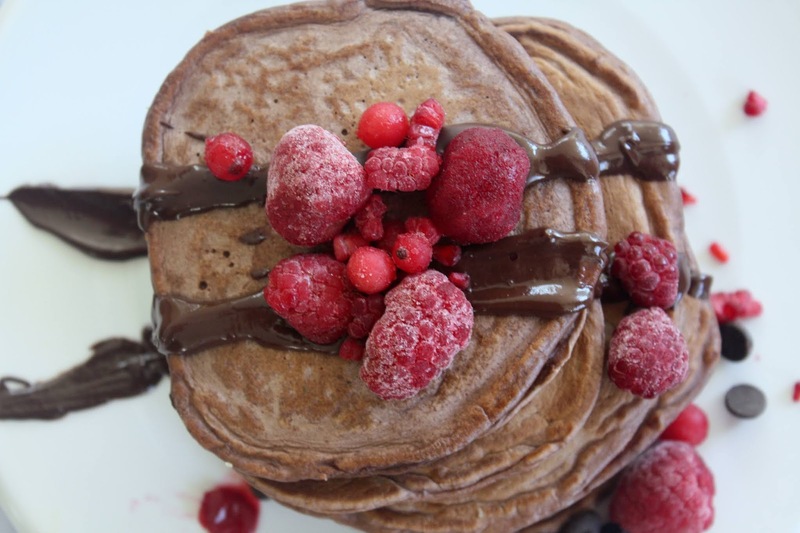 Stack up your hot pancakes and sprinkle with dark chocolate chips and berries. If you're feeling a bit fancy like I was too, you can also melt a few choc chips in the microwave to make a drizzle on top of the pancakes. Now, tuck into your stack and enjoy. QOTD: AMERICAN STYLE PANCAKES OR CREPE STYLE? These look totally delicious, thanks for sharing! Those look so good oh my gosh!! 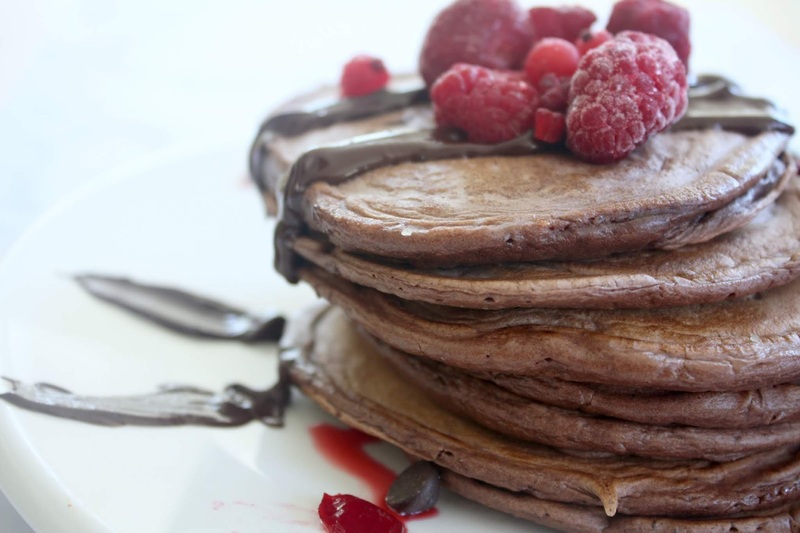 These look so awesome, and I could use cacao powder instead of cocoa powder yeah? Get Healthy with Me // A May To-Do List! Sweet Banana Flapjack Bites // GF Recipe!